The following provides a brief summary of the recent Council meeting on June 28. The complete Council package, which includes the agenda and reports, can be accessed here. Full minutes of the meeting will be available in the August Council package. This summary is provided to increase transparency, and to support Councillors in completing their obligations under Bylaw 2.3.5; “shall regularly communicate with his or her constituents concerning the activities, programs, and decisions of the Society”. If you have any questions, please contact our Communications Administrator (sogs.communications@uwo.ca) or the Speaker (speaker@sogs.ca). The next Council meeting will be on August 30, 2018 at 6pm on the Grad Club patio. SOGS is going to Wonderland on July 28! There are still tickets left in the SOGS Office (MC 8). TOMORROW (Friday, July 27) is the last day to purchase them. Hurry! 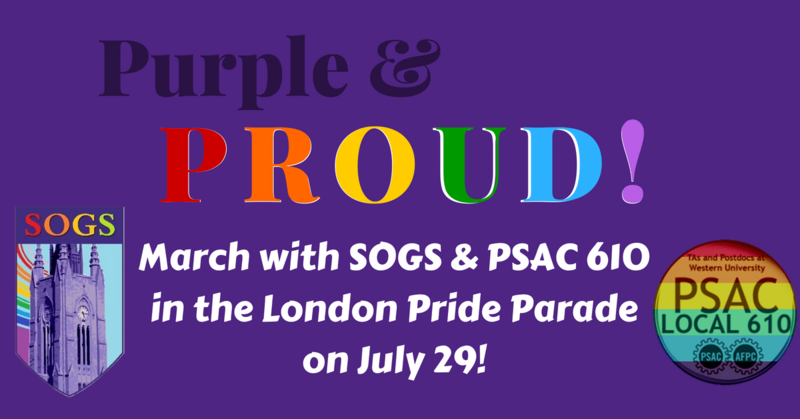 March with SOGS and PSAC 610 in the London Pride Parade on Sunday, July 29! Thesis Completion Fund applications due to the SOGS Office (MC 8) by July 31 @ 4pm. Please help SOGS complete our Department Graduate Student Association/Council list. Graduate Student Cookbook Contest! Submit to gps@sogs.ca and post your recipe on social media by August 31 to win! Need SOGS to attend your September Department Orientations? Contact sogs.communications@uwo.ca. Please share this SOGS Council Summary with your members via email and/or social media. SOGS Orientation (September 10-15) is planned! Graduate Wellness Week (Oct 1-6): “Living on a Tight Budget”: Graduate Student Cookbook contest deadline extended until August 31 to gps@sogs.ca. SOGS Orientation (Sept 10-14): join the Facebook Event page and SHARE WIDELY. Graduate Peer Support (GPS) will launch weekly drop-in peer support starting Wednesday, September 19 from 2:30-4:00pm. Looking for department-specific graduate student upstander training? Contact Melanie Stone (wcc@sogs.ca), our Women’s Concerns Commissioner who recently ran upstander training for 20 graduate students. Stay tuned for Sexual Violence Awareness Week in October and a “Times Up” event. Are you a graduate student parent? Contact Melanie Stone (wcc@sogs.ca) to get involved with our Graduate Student Parent Advocacy Group! The Equity Committee will be launching its Annual International Graduate Student Household Drive the week after Orientation. The Sustainability Committee is looking for new members: srakhimb@uwo.ca. BIRT as of September, 2018, the Council year continue to begin in October. BIFRT Councillors bring constituent feedback on “Empower Me” to August Council.